Seems odd now that I think about it, but in two years living in South Melbourne I've yet to visit more than the bare minimum of pubs in the local vicinity. Time being somewhat in long supply, and Tuesday's now being somewhat free; it seems opportune to revisit an old series, and make the trek around the southern locale. I started at the The Water Rat, mostly because I've already been there, and knew that Tuesday offered one of its most under-rated delights: a very cheap Steak night. $12 gets a 200g steak and healthy serving of fries with a choice of sauces. The mushroom sauce was merely okay; the addition of greens helped an otherwise rather sad pile of mushrooms, but I can't fault the steak, and that's rather the point here. The Water Rat classy darkly lit decor - it tends to look closed on first inspection - matches well with its selection of exotic beers, quiet patronage and classy exterior, but contradicts its well priced bar menu. Couches - an under-rated pub feature - and booths offer a very comfortable alternative to the tables, high and low, if you get in early before the guys working their start-up on the free wifi get there. This is a good pub, one I should spend more time in. Addendum (Dec 3rd): The red wine sauce is vastly superior. The Short: For quiet dining and reading. Not exactly a ringing endoresement for test cricket in the lower ranks. They'll need more than a test championship to enliven this type of series if sides are going to run up 469 and 501 respectively across three and a half days, and then play out the draw. But then, both sides also let opportunities slip that might have given them a positive result. New Zealand were 7/282 following a short collapse after Williamson (114) was dismissed, but were rescued by Watling (103) and Boult. Likewise, after Mominul Haque (181) was out his side was 6/301, but Sohag Gazi (101*) pushed them into the lead. A collapse from either side would have forced a result, but although Gazi's 6/77 included a hat-trick, it was too little, too late. A word then, on Shakib Al Hasan instead. He had a relatively anonymous match, but he passed 2000 runs, after already going past 100 wickets, making him the fastest, in matches, to achieve an all-round feat that only 25 players had achieved before him, most (if not all) of them greats of the game. He wasn't the youngest, mostly because he plays so few tests, though only Kapil Dev, Shastri and Botham beat him to the post; and as already noted, none were faster, and it wasn't close. Shakib's 31 games beat the net best - Trevor Goddard - by five games. An average of 36 with the bat and 33 with the ball under-states his value. He is a spinner who rarely gets a fourth or fifth day pitch, and a batsman who rarely comes in with a foundation to build on. That has undoubtedly helped him get the opportunities he needs, but he is, in the American parlance, putting up hall-of-fame numbers, and he deserves more recognition. There was so much to enjoy in this match. Mohammad Irfan and Junaid Khan's opening burst, Hashim Amla's untroubled class, and Saaed Ajmal and Zulfiqar Babar's skillful spin in the first innings. The depth of contributons on one side put Pakistan on the front foot as 249 was onyl enough if Pakistan collapsed. Surprisingly, they did not, with Khurram Manzoor and Shan Masood providing an elusive big opening stand, allowing Misbah-ul-Haq to stretch the lead out t almost 200. Pakistan went to work again in the second innings with similar results, albeit with de Villiers providing the resistance. Three quick wickets were largely irrelevant in a chase of 40, and Pakistan prove again, both their remarkable ability to blow hot and cold from match to match, and their strength in the UAE. South Africa have the class to regroup, but even with Kallis - who had a miserable match - and Duminy they lack bowlers in the heat and on the unforgiving pitches. Pakistan didn't really grind out the runs, but they looked much mor comfortable when Steyn and Philander were through their opening spell, and it is a long haul to a second new ball if those opening break-throughs don't occur. Mostly though, they need more runs from what is a very long batting lineup, but an oddly fragile one. They've not reached number one without being resilient though, and the second test ought to be an equally intriguing contest. A weakened Afghan side was still far too good for a Kenyan side reeling from three successive maulings in the T20 and WCL games that preceded this one. Kenya did reasoably well at first, from a shaky start (8/84) the tail put together enough to get to 162, and Ragheb Aga (5/46) - a player around whom they will rebuild for may years - reduced Afghanistan to 6/63. Amongst the wreckage thoough, was Rahmat Shah, having not batted in his previous 6 games for Afghanistan he went full-Bannerman, making 144 of 234 all out; a lead more than sufficient to see Afghanistan coast home from then on, rolling Kenya for 140 and running down the 69 required inside 15 overs. The final will be played in early December, with Afghanistan perhaps slight favourites, given relative home advantage, their superior rating, and the chance they can bring Hamid Hassan along, the class bowler of either side. Recent matches for both sides haven't been at full strength though - a sign of how far above some of their fellow associates they are - so the ratings are not reliable guides. It ought to be a very good game, pitch permitting. A short show today. We wrap up the last four games of the World Cricket League Championship and the end of the preliminary round of the Intercontinental Cup with UAE National cricket journalist Paul Radley (@paulradley). Andrew and I discuss whether both tournaments have worked and what they might their future might entail. And there is a little news from mathes involving Hungary, Poland, Hong Kong and Uganda as we gear up for the World T20 qualifiers. We believe there is an overall lack of transparency around financial distribution in global cricket, which means certain aspects of the finances of global cricket are not well understood. We have been unable to obtain a full picture of the current financial position of global cricket. For instance, although there are various media estimates in circulation of the impact of tour cancellations (actual or threatened), it is not known with any degree of certainty the financial effect a tour by one Member has on another Member. It is clear that tours by certain Members (such as India) to other Members give a significant revenue boost to the host nation. The level of funds flowing through the ICC and global cricket has been completely transformed in the last ten years, with a significant increase in revenues, principally from growth in income from television rights. For ICC-run events, the additional funds from television rights flow through the ICC to the Members. For other competitions and matches, such as those under the FTP, the income flows directly to the Members. The most notable source and beneficiary of the greater revenue flowing into cricket is India. That nation's love of the game has combined with significant population and GDP growth in recent years, to make India the commercial hub of world cricket. 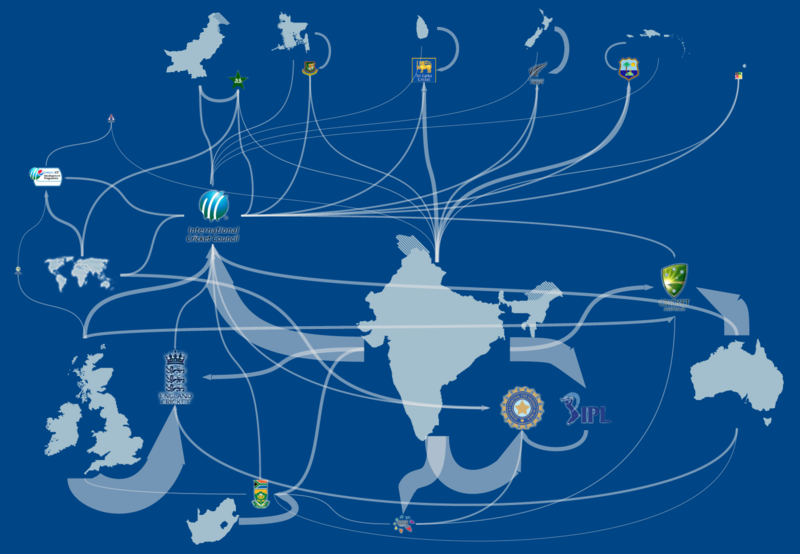 There are unsubstantiated estimates that India generates between 60% and 80% of revenues flowing into global cricket. India also has a significant impact on the ICC's Commercial Revenue, as almost all of the ICC's major commercial partners have significant links with India. The basic structure of cricket finance runs from TV markets - nominally constituted at a national level - to either the home board of a particular fixture, or the ICC. We therefore need to make three assessments: the size of a local cricket market; the flow of money generated from that market to various bodies; and the distributive flow from the ICC and others. For most purposes here I'll be talking averages over four years, because this takes into account the cycle of both the FTP (give or take), and the ICC major events. Every cricket board exhibits substantial variation from year to year, depending on who is touring, and the dividends distributed by the ICC. This is the most inexact of all the estimates, not least because it isn't clear what percentage of the cricket market is actually being drawn on by various members. Empty stands and no push to fill them by sensible scheduling, and fixturing that makes an inefficient use of resources, and no attempt to contextualise the season means most boards make less money than they might. A previous assessment of TV rights deals across sports in Australia indicated that cricket gets roughly what you'd expect, given its ratings, and total hours of programming. Taking into account sponsorship, merchandise and match-day attendance; then cross-checking against Cricket Australia's annual reports, and adjusting for income earned from overseas, puts the size of the Australian cricket market (or at least, the part of that that pays to watch professional players), at something like an average of AUD$150m (which for current purposes is nearly identical to USD) over the past four years. The most recent TV deal has probably inflated that to nearer AUD$200m . The continuing rapid inflation of sports rights makes this process harder than it might otherwise be. The simplest model for calculating market size is to multiply GDP (incomes, which includes population) but the level of cricket interest. There are various reasons why it won't correct: the distribution of cricket fans amongst income quartiles (particularly in England and to a lesser extent India where cricket is an upper-class sport); the size of disposable income which will make the sports market in wealthy nations much larger; and the difference between TV income and ground income, with the latter more easily captured in richer, but smaller nations. Nevertheless, I'll look at three methods of assessing cricket market size. Two are quite simple but (relatively) complete, the third complex, but stifled by the lack of annual reports from the most poorly governed members. + Estimates of USA market size are very sensitive to assumptions. The K+P figure was close to zero, but also 8 years ago, and there has been a recent shift towards more cricket articles. Similarly, estimates of the number of players vary from the official figure of ~30,000 to ten times as many. Consider this a low figure; under reasonable assumptions the USA is cricket's fourth biggest market. Though almost none of that goes into US cricket. # K+P give two figures for England - 8% normally and 17% in summer - I have used the higher one for obvious reasons (estimates outside the season are irrelevant). They don't offer similar figures for Australia, which makes all the figures in this column sensitive to this assumption. One of the more interesting pieces on cricket take-up in various nations is the 2005 piece by Kaufman and Patterson. It is worth reading the paper, but for my purposes its most useful feature is an estimate of cricket popularity by counting articles in the sporting press. The numbers have been relayed into the table above, and used to calculate, by multiplying that out by GDP and a factor that makes the markets I have good data (Australia, England, India and New Zealand) approximately the right size (around 120,000). Playing numbers as a proportion of population ought to be a good measure, but are complicated by the fact that, although have a complete set of figures for associate/affiliate nations, I have none for most test nations. Estimates of the major nations should therefore be taken with very large grains of salt. Nevertheless, it gives some reasonable numbers, and those give a good indication of the size of markets where published annual reports are sparse, or the market is undeveloped for lack of matches. Estimating market size from actual revenues is complicated by the amount of revenue generated by most boards in external markets (either overseas tv rights or sales to spectators), and the lack of reporting on the source of that revenue. India is perhaps the easiest market to estimate, because the BCCI generates relatively little profit from external sources. Their annual report puts average four year revenue (adjusted for currency) at USD$168m, of which $25m is dividends from the IPL or CLT20. Those two competitions have approximately $240m in revenue. The ICC brings in around $200m in revenue a year, of which India is the source of approximately 60% (by most accounts). Finally we must estimate the amount of revenue earnt by playing India at home, and which therefore goes to the local board. If that is assumed to be around $100m then the Indian market is roughly three times that of Australia and England: around $600-700m. This is less than most estimates, but consistent with their annual reporting. What we really need to do though is understand where the money comes from, and where it goes. ICC Distributions are relatively easy to calculate, and the annual report is quite informative. 75% of profits - after events costs, TAPP payments and administration are removed - are paid as dividends to the ten full members, with the remaining 25% going into the development fund, the majority of which is distributed to the 96 associate and affiliate members. Dividends to full members over the last four years were USD$319.9m, with USD$41.4m being distributed to the development fund. That doesn't include prize money, or TAPP funds, from which relevant members took an extra million or so (relatively little, when considered over four years). Non-full-members are paid according to a scorecard system - judged on 35% the men's ranking, 41% various participation figures, and 24% administrative development. The top-tier receive $300,000 USD, the bottom $5,000 USD, in addition to $100,000 for associates and $10,000 for affiliate members. High Performance Program members receive funds commensurate with the expected costs of transitioning from amateur to semi-professional cricket structures, depending on what events they play and qualify for. The Asian Cricket Council derives significant additional funding (approx $5m) from the Asia Cup, which in turn feeds into their member-base. The top line of figures - in thousands USD - is the important one - the second is the standard deviation which is worth noting only because they are quite large (around $1.2m on each variable). By multiplying out the revenue earned for a day of cricket by the number of days played I've estimated the flow from markets to boards in the following figure (click for pdf version). The BCCI earns around $4m more than average from home matches, as does England, with Australia on $2.7m. (All give or take $1.2m; the Ashes earns at the top-end of those numbers - i.e.. above $4-6m per day). This makes intuitive sense. It also shows the importance of attendance versus TV in the revenue streams of otherwise smaller markets, and the weakness of the BCCI in creating a home schedule that meets what they might earn. As the annual reports bear out, India earns less from their home internationals than England, which doesn't accord with their perceived financial muscle. Notwithstanding that the IPL effectively doubles what the BCCI make from their home market, they ultimately end up with only around half the revenue generated locally, despite having a monopoly control over the team that market pays to watch. This is both quite surprising, and an indication of why they are increasingly bullish about increasing their share of global revenue. Board revenue has increased by $6m a year; that is, the regression estimates base revenue of $29m in 2000, and $89m in 2010. Obviously only three boards actually earned this; the variables are best interpreted as relative amounts. Moreover, the large standard deviation hints at the growing disparity in how much teams have managed to gain from overall revenue increases. Playing India earns $1.6m for the home team more than Australia or England, and $2m more than any other team. This, in one sentence, explains most of what you need to know about the nexus of finance and the obnoxious chaotic scheduling of the FTP. South Africa make $450k above the base rate (around $1m per match) from home matches, but New Zealand and the West Indies are making less than that, which means matches against teams outside the big-3 are likely to be losing money. We know this, in relation to why test cricket costs these teams money to play, but add in Pakistan - whose market lies dormant with no tours possible; Sri Lanka, Bangladesh and Zimbabwe, and it is clear the bulk of fixtures are neither profitable nor generating particular interest. The total size of the non-full member market is around $90m; but it is almost certainly not being tapped. Zimbabwe has no market to speak of at all - less than $0.5m. Their GDP is tiny, their population is small; cricket is a minority sport. You frequently hear commentators remark on the importance of building up existing markets, rather than chasing markets in nations cricket has a small profile in. This is basically nonsense. There are three really big cricket nations, each of which has a GDP in the top-15 in the world. There is limited scope for growth in the big-3. But amongst the rest, because they are already pushing against the point of market saturation; and because their GDP is relatively small - despite their population size in the case of Pakistan and Bangladesh - their potential for growth is weak. If one attitude weakens cricket's case for globalisation it is the perception - largely because of the bias in the origin of the cricket media - that there is a certain standard to aspire to equal to India, England, Australia and perhaps South Africa. With the possible exception of the USA, and in the longer term, China, no nation will reach that standard in the next 20, or perhaps 40 years, without remarkable (unprecedented) growth. The nations currently in the HPP are too small, or too poor, or both; the G-20 nations that might open up new frontiers have tiny playing bases. There is, nevertheless, strong encouragement to the idea that cricket could have 20 nations of a standard somewhere between that historically maintained by New Zealand and currently by Bangladesh. With the assumption that, given that, at least a half dozen of those teams will have a transcendent talent (ala Hadlee or Muralitharan) that will allow them to compete with the big-4. A future post may look into this; as some nations will surprise. If it wasn't obvious, cricket's finances are fundamentally unstable. The wealth available to three boards, and their local competitions means that noone else can afford the market rates for their players. While we haven't seen mass defections, it is increasingly clear that international cricket, as currently structured, cannot support the existing nations, let alone provide the investments needed to promote and grow the game elsewhere. Either a substantially larger proportion of the money moving from market to boards needs to be routed through the ICC (which means them taking ownership and control of tournaments), or a substantially larger proportion of the money must direct itself into competitions that will pay players from all nations, with a reduced emphasis on international cricket. This would not be historically unusual; it has been the case for West Indies cricketers from the turn of the 20th century in English league cricket, through Constantine and Sobers; and onto the Packer years. There are also various ways both these scenarios could come to pass. Some are outlined in my manifesto on test cricket; others ideas will have to wait for another day. But don't be surprised if the CSA-BCCI spat is a harbinger of things to come. There are too many opportunities for the BCCI to redirect money currently exiting the Indian market back into their own pockets, and too much inequality, for things to stay as they are. It is interesting the cricket's largest markets come under both the best and worst governed nations but relatively few in the middle. The crisis of governance at ICC level is exacerbated by very different philosophies of action by its board members. The late Ronald Coase would have found this interesting. There is no good reason why boards couldn't bid for tours, thus maximising both BCCI income and cricket's overall revenue by playing the most desirable fixtures (albeit not those that make the best competition/product). Transaction costs at the ICC are high though, and we are far from man efficient touring structure. Also, apparently cutting a google map means I get abused by nationalist idiots over J+K. I don't care. Don't bother me over your craziness. It isn't remotely relevant to cricket. There has been no shortage of remarkable test matches this year, but unless you are an England fan, none have been terribly heart-warming. This match corrected that. Zimbabwe wins were few an far between in the best of times, and we are a long way from those. After the first test they looked to lack that winning habit to take advantage of any lead, with the eventual margin indicating that Pakistan could win even if they failed to bring their second-best. The obvious danger for Pakistan was that their misfiring top-order was leaving a lot of work for the experienced middle; and that the return of Zimbabwean captain Brendan Taylor would give them the touch of class and backbone they needed to stay in the match just that little bit longer. Masakadza and Taylor contributed 197 runs, almost half Zimbabwe's total; Younis and Misbah had 218 in response, almost, but not quite enough, as the latter was left stranded by the inept batting of his team-mates (Khurram Mazoor aside), and the skills of Zimbabwe's bowling attack. Vitori in the first innings and Chatara in the second (both 5/61) provided the impetus and skill, swinging the ball when it was new - and helped in no small part by the slow batting of Pakistan who afforded them a second new ball with far fewer runs on the board than they needed. It was tense, and Zimbabwe needed almost every one of the runs that they managed to grind out on the first day, but as the celebrations showed, they were both deserving and enthusiastic winners. Unfortunately for Zimbabwe, the result is ultimately meaningless, wih no further tours planned over the summer, and no funds to allow them to do so. They lie, again, in limbo until the next tour, with little quality preparation for the WT20, which will be their next moment in the spotlight. For Pakistan, they now must host South Africa in the UAE. Perhaps the last team they want to see given their batting problems, though their form in the UAE is vastly superior to elsewhere. Not as remarkable a win as the scorecard might imply. Namibia sent a much weakened squad for both the I-Cup and WCL games and got the thrashing they deserved in both. This match was over in only two days. A spin induced collapse to Ahmed Raza (7/37) meant Namibia was all out 90 half-way through day one. Shaiman Anwar's rich form continued with 81, although Viljoen (4/32) kept the result slightly better than embarrassing, and a breezy 49 from van der Westhuizen at least got Namibia over 150 and forced U.A.E. to bat again in the second innings. They've done the I-Cup no favours with its future in some doubt and this kind of pointless mismatch between an A-side would indicate that a cup format might be better than an extended league ending with a lot of dead games. A series that snuck up, fixtures being something that don't need to be announced until a few weeks prior to the event in most of the cricket world. Bangladesh have no recent form to talk about, but whether that means they'll struggle or be well prepared for a home contest against a team they ought to be challenging is not clear. New Zealand played well throughout the last year, albeit in largely favourable conditions. Their bowling attack is coming along well, and there remains potential in the batting, though most haven't flourished as it might have, and is it will as it matures. Bangladesh's most recent hoem tests have been played on very flat and slow decks that have favoured their spinners and kept their propensity for collapse from beng an issue. If New Zealand stay patient they should score big and win easily. If not, this might be an interesting series. Pakistan ought to be a much better side back in the U.A.E. than they showed on either of their last two trips to Africa. They'd want to be though, with a dispiriting loss to the world number one at the hands of a debutant, and a loss to Zimbabwe making for miserable reading. Their batting has struggled for a while now, though it was hidden at "home" against England because of the dominant performance of Saeed Ajmal. They will need every one of his tricks again to roll over the South Africans, whose only weakness would probably be a lack of recent cricket, and the strong possibility of their cricket board going bankrupt. South Africa have no comparable spinner to Ajmal, but their batting ought to blunt him sufficiently to allow Steyn and company to do the job. Conversely, the last set of matches between these two sides in the U.A.E. were high-scoring draws. Hopefully they won't decide to roll out the concrete; but keep in mind that the pitch in these matches may matter even more than normal.